Welcome home to this Craftsman Cottage nestled on the corner of Lottie and Prescott. This charming remodeled 2 bedroom, 1 & 1/2 bathroom home features beautiful amenities & upgrades throughout. The open floor plan lends itself to multiple uses of space. Currently, the 2nd bedroom is enjoyed as a formal dining room. Wonderful vaulted ceilings, LED canned lighting & wood floors. Luxurious custom blinds & draperies enhance the double pane windows and glass door. 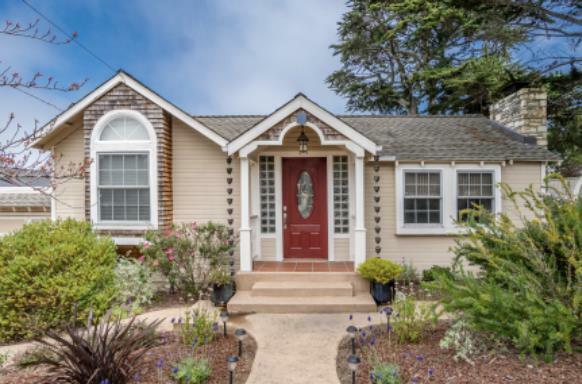 Curl up with a good book next to the Carmel stone fireplace or greet the outdoor sunshine strolling to the nearby bakery, restaurants and shops. The enclosed side yard is perfect for bbqs, entertaining & outdoor enjoyment. Easy care drought resistant plants, hot & cold water outdoor faucets, rain cups & the sweetest side gate. The garage includes additional storage, a tankless hot water heater, a useful sink & custom garage doors. You will fall in love with this enchanting home along with this quaint & convenient Hilltop location.